Attis Industries Inc., a diversified innovation and technology holding company announced on January 22 that it has entered into a definitive asset purchase agreement with Sunoco LP (“Sunoco”) to acquire and operate its corn ethanol plant and grain malting operation in Fulton, NY, the Owego County Today reported. The plant will become the essential element of Attis’ expanding technology portfolio as it develops the site into the most comprehensive Green Tech campus for renewable fuels in the country. Total consideration for the divestiture is $20 million in cash. The transaction is subject to regulatory clearances and customary closing conditions and is expected to close in the first quarter of 2019. Attis expects to finance the transaction with non-dilutive secured debt financing. Included within the acquisition is the 1886 Malt House which is a direct beneficiary of incentives designed to promote the local farm to brewery industry. In 2013, New York created a farm brewery law to provide licenses only to those farmers whose beer is made primarily from locally grown farm products. Under this program, the Malt House will receive some tax-exempt status and contribute to the $4 billion per year craft brewery business in the state of New York. 2018 was a good year for the Tunisian Beverage Manufacturing Company (SFBT). 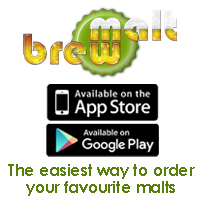 The first brewer in Tunisia managed to achieve record sales of beer, the African Manager reported on January 24. As of December 31, 2018, the total turnover of the SFBT reached 650 million dinars against 571 million a year earlier, up 13.8%. This performance is mainly attributed to the 21% increase in the turnover of local beer, which went from 360.7 to 436.6 million dinars between December 2017 and December 2018 (+76 million dinars), generated by the sale of 184.4 million litres of beer. Sales of soft drinks rose by 5.6% to 150 million dinars at the end of December. On the production side, the company produced 1,453,462 hl in soft drinks in 2018, while beer production increased by 9.7% to 1,886,083 hl. In addition, investments over the reporting period amounted to 52.3 million dinars (+ 36%) and consisted mainly of new extensions in the company’s factories and the purchase of equipment. As for the debt, it stood 125 million dinars on December 31 last against a balance of 109.8 million at the end of December 2017. According to a survey conducted by the Ministry of Agriculture, Food and Rural Affairs and the Korea Agro-Fisheries & Food Trade Corp., the average frequency of drinking for mainstream consumers was 8.8 days a month in 2018, which was the same as the previous year, The Korea Bizwire reported on January 21. The survey was conducted with the participation of 2,000 men and women between the ages of 19 and 59. While the frequency of drinking was same as that of the previous year, the amount of alcohol consumed has steadily decreased. Among respondents, 30.5 percent answered that they drink 1 to 4 days a month, 29.7 percent answered 5 to 8 days, and 26.7 percent answered 9 to 16 days, while 13.2 percent drank more than 17 days a month. Consumption wise, respondents drank an average of 6.3 glasses per drinking session, compared to 6.9 glasses last year. The average consumption of alcohol at a time is steadily decreasing, as it was 8.3 glasses in 2014, 8.2 glasses in 2015, 7.9 glasses in 2016 and 6.9 glasses in 2017. We have entered the time of year when the farm shows are in progress. The Crop Production Show in Saskatoon just finished and the Brandon Ag Days will begin this week. 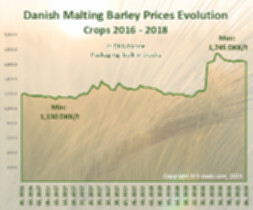 Traditionally this is when the maltsters and grain companies reveal pricing ideas for their malt barley programs, Canadian Malting Barley Technical Centre (CMBTC) reported on January 23. 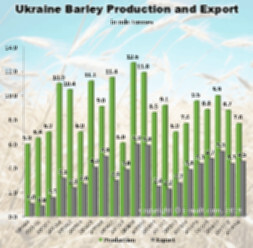 Farmers anticipate malt barley prices to begin at a minimum of C$5/bushel (bu) and higher. There was not much in the manner of published prices from the Saskatoon Show, however C$5/bu was indicated for Sept/Oct. by some exporters and one maltster began its new crop program at C$5.25/bu.